I'm almost finished reading What Would Google Do?. I have 31 pages to go. It'll take me a bit longer to get my notes up on FriendFeed: Hightouch Book Club, but I think it's safe to say we're within a week of starting the next read. 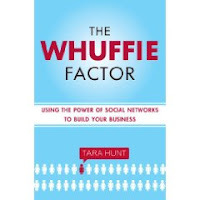 The next book will be The Whuffie Factor: Using the Power of Social Networks to Build Your Business by Tara Hunt. I wanted to announce the book early just in case you're interested in reading along. When I visited B&N to pick up Whuffie I also purchased, The Philosophy of John Dewey which includes two volumes: The Structure of Experience, and The Lived Experience. I'm thinking this book won't fit the primary criteria of the book club, "the intersection of technology and culture (loosely defined)." If I get into it and decide it might work I'll add it to the list.